In Greenland you get to play through a momentous period of human history. You play as one of the peoples who attempted to colonize Greenland during the Middle Ages. This version of Greenland also includes the little-known Sea Sami expansion pack. Compared with the 2nd edition, this edition introduces a 4th player (Sea Sami), custom meeples for each tribe, new domestic animals and daughters, upgraded art, new play aids. Contains 63 cards, 4 elder boards, 72 custom meeples, 4 large meeples, 52 disks for energy, ivory, and iron, 10 dice. Designed by Phil Eklund, the designer of High Frontier and Pax Porfiriana. Art by Karim Chakroun. 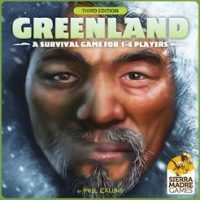 Add a Review for "Greenland (3rd Ed)"